‘Mr. Gold’ of the 1970s, Jim Sinclair, the one-time adviser to the Hunt Brothers who cornered the silver market then is flagging up an imminent change in the way the bullion banks manage their spreads, something he feels is inevitable from his own long experience of the business. The Oakland Athletics may or may not be the best team in Major League Baseball — facing an 0-2 deficit in the playoffs, that designation will be decided on the field over the next few weeks. We can say for certain, though, that Oakland, led by general manager Billy Beane, is the most efficient team in all of baseball. Though Beane’s player payroll was the second-lowest in all of baseball, his A’s won 94 games this season, the second-highest total in the American League and the 10th-highest total since the team moved to Oakland in 1968. The A’s paid the least amount of salary per win in the major leagues in 2012 — by far. Put another way, the A’s won 25 more games than the Red Sox for less than a third of Boston’s payroll. How did the A’s do more with far less? What was Beane’s secret? These questions, of course, were precisely the ones that Michael Lewis asked almost a decade ago in his classic bookMoneyball. A closer look at the A’s remarkable 2012 season yields fruitful lessons for investors and students of business in general. Moreover, the Fool has been a big believer in the idea behind Moneyball for years. 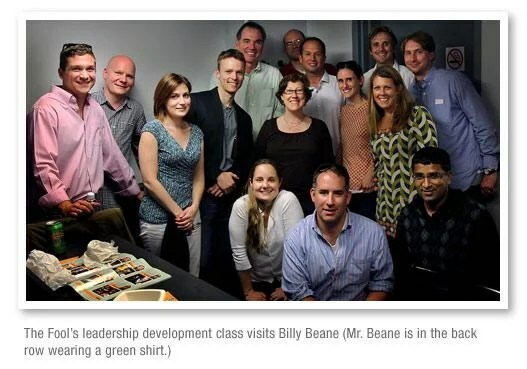 We’ve hosted Moneyball author Michael Lewis at Fool Global Headquarters on three occasions. We’ve met with Paul DePodesta, the former assistant to Beane and current VP of player development for the New York Mets, who helped advance the idea of sabermetrics that Beane eventually used to rebuild the A’s. We reference the book in our employee development programs, and our executives keep a copy of it on their desks. This year’s A’s showed that Billy Beane’s approach can be extremely flexible and opportunistic when it comes to building a playoff team. On the pitching side, the team has relied heavily on young, relatively inexperienced players. An example is reliever Sean Doolittle, who appeared in 44 games, and struck out 60 batters in just over 47 innings. He had pitched in college, but was a first baseman and outfielder in the pros until multiple knee surgeries had him pitching again last year. Beane said recently that if you were to point to one story on this team, “the journey that Doolittle has taken is pretty amazing.” But Doolittle’s just the beginning of the rookie pitching magic. A’s rookies won a record 54 games, according to the Elias Sports Bureau. And with the season on the line, a rookie started every single one of the final 14 games. This shouldn’t be surprising given that Moneyball is more about finding mispriced talent than it is about anchoring in on just one or two metrics. The proportion of objective versus subjective analysis is weighted more in some organizations than in others. From our standpoint in Oakland, we’re sort of forced into making objective decisions versus gut-feel decisions. If we in Oakland happen to be right on a gut-feel decision one time, my guess is it would be random. And we’re not in a position to be making random decisions and hope we get lucky. If we’re playing blackjack, and the dealer’s showing a four and we have a six, hitting on sixteen just doesn’t make sense for us. Our ideas start with a story. Is the market missing something that we see? Once we find an idea, the due diligence starts. We try to uncover a mispricing, and then we invest. It was this type of approach that led Einhorn to invest in Apple back in 2010, when some investors thought the stock couldn’t possibly rise any further. Similarly, the search for mispricing allowed Einhorn to recognize that Green Mountain Coffee Roasters was tremendously overvalued in the fall of 2011.